I’ve had him ranked on top for several weeks now and see no reason to change at this point. He’s done nothing wrong, he looks fantastic physically, and you had to love his last work, a sharp half in an un-Pletcher-like :47 1/5. Working outside his stablemate, he did everything on his own with his ears up and inched away at the end with an :11 4/5 final eighth. He is carrying good flesh, his coat is bright, and he just looks like a horse who is rounding into peak form. I was surprised to see a :11 2/5 opening eighth in his work, attributing it to him simply being sharp, but when you can go an opening eighth in :11 2/5 and still come home in :11 4/5, and then gallop out as strongly as he did, that basically suggests a horse who is at the top of his game. He is starting to get good reviews from some of the experts watching him in the morning, so perhaps he will take some money on Derby Day, even though he is still ranked seventh in the Derby Media Poll. One thing you always look for close to the Derby is for a horse to tout you on himself, and Good Magic has been doing a super job of touting, with two exceptional works over the track, the latest a five-furlong breeze in 1:01 1/5, with the rider taking him well off the rail to assure he didn’t go too fast. He finished well and again galloped out very strong, as he did in his first work. His speed figures are all over the place, and it’s all about which ones you choose to follow. His Beyers are good, not great, and he will need to improve off of them; his Brisnet speed figures also need to improve, as do his late pace figures; but his Thoro-Graph numbers, which takes into consideration many more variables, are right up there with the best of them, and he seems to be on an excellent pattern to turn in a peak performance on Saturday. Brown has him on a perfect third-race peak pattern, and he just looks like a horse who is thriving at Churchill Downs. Remember, he’s already accomplished things horses are not supposed to do. He made his first appearance at the Downs Tuesday and was the center of attention; an absolute powerhouse of a horse who moved briskly around the Churchill oval as if he’s been there his entire life. It appears obvious that Baffert’s main goal is keeping him fit and happy and not asking him to go too fast. Because of his humongous stride he loses a touch of momentum turning for home, but gets it back up after switching leads and keeps building up power, which enables him to gallop out like a fresh horse still full of run. Frankly, nothing he does would surprise me. I have made it clear that I’m a little wary of horses having only three career starts, which is more glaring than not having raced at 2. But he is so unlike other horses and is so physically gifted he is more than capable of trashing all these historical trends that are against him. He will have to be at his professional best on Derby Day, not having traveled outside of California before, and cannot get too wound up before the race. From a speed ratings standpoint, his Beyers and his Brisnet figures are outstanding and consistently faster than any other 3-year-old, and his latest Thoro-Graph figure equals the fastest run in this country this year. Only Mendelssohn’s other-worldly UAE Derby is faster. Most impressive is running triple-digit early, middle, and late pace numbers on Brisnet, while getting progressively faster. It is all about how he handles the big field and the contentious pace. Of which he will be part. If he can win the Derby off three starts, combined with being unbeaten, he will earn instant superstar status. I moved him back up to No. 4 after his most recent work, a half in :48 1/5, which is exactly what I was looking to see. In his last work, his eighths got progressively slower, but the reason for that was Victor Espinoza felt it was important to ask him for speed early, knowing you need to break sharply and have enough speed to get position into the turn. Only then can you take hold of your horse and let him settle in stride. This time he let him finish and he looked sensational down the stretch, flying home his final eighth in :11 and change and then galloping out with good energy, pulling up six furlongs in 1:13 4/5. What made it all the more impressive was the way Espinoza’s hands were way down on the colt’s neck and never moving. I also loved the way he galloped slowly to pole with the pony, and as soon as he was let go he dropped his head, grabbed the bit, and was immediately in full stride, as if turning on a switch. He actually has the fastest Thoro-Graph figure of any horse in the race (other than Mendelssohn), which he earned in last year’s FrontRunner Stakes. After pairing up his two races this year, he may be ready to return to that number. He looks to be a big value horse, considering his credentials, and is a horse who will make you feel like kicking yourself for leaving him out of your bets. He is a tremendous physical specimen, with the long body of a true stayer. As one can see from his recent rankings, I am having a tough time trying to figure out just where to put him and feel comfortable about it. Part of me can’t help but consider his pedigree, but the other part sees only a horse who looks as if he wants to go farther. His Florida Derby still is as impressive a prep as I’ve seen all year. It is probably time I let go of his sire’s record at classic distances and the speed in his female family and concentrate more on the horse himself and some of the stamina he does have deeper in his pedigree. He just has shown no sign that the extra furlong will faze him and his middle and late Brisnet pace figures show him to be a horse who can run fast throughout the race and still come home very fast, which makes him extremely dangerous. So, why is he ranked No. 5 and not No. 1 or 2? I wish I could answer that, other than to say the four ahead of him are no slouches either, and three of them should offer better value at the windows. Pletcher worked him with a pretty fast horse named National Flag in his final drill, and it seemed as if they made sure he didn’t get away from Audible, who, as we know by now, is not a great work horse. His :49 2/5 half-mile was pretty much on par with his other works. I know it’s going to sound as if the top seven ranked horses all look great and can win this race, but that is how competitive the Derby looks on paper and how talented these horses are. If you ignore the now stale pedigree question, he looks like your quintessential Derby horse who can adapt to any pace scenario. A must use on all tickets. I get the fact that this colt could be as talented as any of them and probably is ranked too low, but in factoring the scenario of the race, the good possibility he still may be a work in progress due to his late foaling date, and the touch of greenness he’s shown by drifting out in his races, I feel we still might not see the best of him until a little later on. After all, he has run only four times, all this year, and has crammed a lot of racing and shipping into a short period of time. All that could help or hurt him in the Derby; it’s hard to tell. He is a brute of a horse physically, so it looks as if he can stand up to most anything. Like Vino Rosso, he turned in a spirited half-mile drill in :47 2/5 working in company and doing it well in hand and galloping out very strong. It did look like he had intentions of wanting to get out a little in the stretch, but had his workmate on his outside to eliminate those thoughts in a hurry. It seems that Pletcher has been working him on the inside for just that reason, and I doubt Luis Saez will have him on the far outside if he can help it. He did close very fast in the Arkansas Derby, despite drifting badly, but that was after being allowed to crawl on the front end, getting away with a 1:13 2/5 three-quarters. That will not happen in the Derby. It certainly would be no surprise if he won on Saturday, but in this field, you have to look for as close to perfection as you can get, and as mentioned, he still may have a bit of maturing to do. Like the others that comprise the Magnificent Seven, you can rank him anywhere from No. 1 to No. 7 and it’s all splitting hairs; that’s how close the Top 7 are. It all depends on how much stock you put into his UAE Derby annihilation, and how you feel that effort will translate to the Kentucky Derby. We really have no idea what we’re dealing with. Is he on the verge of superstardom? No one can answer that until we see how he adapts to a 20-horse field, with the good possibility he won’t be on the lead this time and will face kickback, and won’t be on a notorious speed-favoring track. If you are a strong believer in his outrageous negative-4 1/2 Thoro-Graph figure in the UAE Derby, then that alone can steer you on him and with confidence, because no one has come remotely close to that number, and that field he crushed by 18 1/2 lengths was a pretty solid one with classy horses from all over the world. Of course we also don’t know how he will react to such a monster effort, especially with Ryan Moore riding him so aggressively through the stretch. Will he “bounce” off such a sensational speed figure or, with the five weeks between races and Aidan O’Brien’s training, will he come close to it, which would make him extremely difficult to beat. If you are looking for a most interesting exacta combination, what better duo to box than Audible and his “uncle” Mendelssohn. After all, are there many pieces more pleasingly audible and dramatic than Mendelssohn’s Wedding March from “A Midsummer Night’s Dream?” Hey, I’m looking for any angle I can find with him. Let’s be honest, there appears to be a significant drop after the Top 7. But that doesn’t mean that many of the others are not to be taken seriously. This is the Derby, and we all know there seems to be a horse or two every year that runs the race of his life ad blows up the exotics. Billy followed up his strong work last week with a smooth half-mile maintenance breeze in :49 2/5, again galloping out with good energy. He’s not as fast or brilliant as the top contenders, but he seems to be thriving at Churchill Downs and could finally have a race set up well for him to at least pick up a piece of it at a huge price. He doesn’t have the rapid-fire acceleration of My Boy Jack to get into the fray quickly, but he does have a long sustained run that if timed correctly can put him into the action. Remember, he did show early speed and aggressiveness when a clear second to Audible in the Holy Bull Stakes, and he was coming on, as methodically as it was, in the Blue Grass Stakes, indicating another quarter of a mile can only help him. With longshots, you want a horse who is looking and training super and appears to be sitting on a peak effort. He is never going to induce waves of excitement the way he runs, and his Beyer and Brisnet figures are nothing to rave about. But his Thoro-Graph numbers are sneakily strong, and it won’t take that much of a move forward off the Blue Grass to make his presence felt. He wasn’t asked for speed at all in his final breeze, an easy five-furlong move in 1:03 1/5, in which he went off very slowly and then finished up well, with the rider shaking the reins on him a little. It will all be about pace, and if he can get a fast contentious pace he has the explosive power to pounce on the leaders and put himself in contention quickly. Of course, he is going to need a lot of racing luck coming from as far back as he is likely to be. But he has shown the ability to come through a narrow opening on the rail and win going away and also swing out very wide and circle the field with a big sweeping move. When he has taken the overland route his best running was on the turn, and he has been unable to sweep by the leaders in the stretch, losing and winning photos after long stretch battles. But a mile and a quarter is a whole new ballgame and he should relish it. Give him credit for getting up in the final strides to win the Lexington Stakes at 1 1/16 miles and on a shortened stretch, with the finish line at the sixteenth pole. He will turn on the afterburners at some point, and we’ll see how far he can keep it going. As I’ve mentioned several times, I have complete faith in his trainer to get the best out of him. Desormeaux, pound for pound, is as astute a trainer as there is in the country and gets as much out of his typical bargain basement horses as any of them. And when his brother Kent is on his game, there are few better in the big money races. I moved him up a spot because I like the way he’s been training, even if it has gone virtually unnoticed due to the overwhelming presence of his three stablemates, who have been getting all the headlines. He breezed five furlongs in 1:01 3/5 with blinkers on and did everything the right way, coming home in :36 flat and galloping out a strong six furlongs in 1:14 3/5. He’s never going to work as fast as his illustrious entrymates, but this was an excellent move. He’ll now have to overcome a six-week layoff, but couldn’t be doing any better. It seems as if he’s being trained to lay farther back off the pace and make a late run, even though he’s been working in blinkers and will wear them again in the Derby. In his last work, he went his first quarter in :25 3/5 and his next quarter in :24 flat before coming home his final eighth in :12 flat and galloping out another eighth in :13 flat. Because of the six weeks between races, Pletcher has been giving him longer works. New rider Florent Geroux should be a perfect fit for him and will keep him relaxed early. We know how gutsy he is from the way he battled back from certain defeat to win the Louisiana Derby. He may be the forgotten horse in the Pletcher arsenal and simply may not be fast enough for these horses, but he has won three of his four starts and he broke his maiden first time out by nearly nine lengths going seven furlongs in a rapid 1:22 flat. So the speed is there. And more importantly, he is going be a huge price, especially for a Louisiana Derby winner. I really don’t like him having only three career starts, especially with a five-month layoff in between his first and second starts, but I have to admit he has made such a big impression on me, I believe he can run a huge race. He makes a grand appearance on the track, has the look of a true classic horse, and I loved his last work, coming home in :23 3/5. I like the way he was given a long gallop prior to his work, then jogged for a bit before galloping to the pole and breaking off in a nice steady stride, a couple of lengths behind his workmate. Once he was asked, he was on the workmate quickly, his ears still straight up, and then came down the stretch on his own with long fluid strides. He continued past the wire in a quick :12 and change. He came back with good energy, as if the work took little out of him. The more I watch his Florida Derby the more impressed I am, especially considering it was only his third career start and he did have alter course when Audible crossed over into his path. I don’t know if he’s quite ready for this assignment, but like some of the others, he may just be a special horse who is capable of doing things most horses shouldn’t be ready for. And popular and deserving would it be for Bill Mott to win the Derby. Is there any trainer more liked or respected?. For a horse who is not known as a strong worker, he looked pretty good breezing five furlongs in 1:00 1/5 at Palm Meadows, which probably was a ghost town compared to earlier in the year. What he has going for him is his toughness and consistency and the ability to sustain a long move. It would be a different story if he were quicker and had a bigger turn of foot. It’s asking a lot for him to beat all these brilliant horses, but at least you know he’s going to try, as he does in every race. If his drubbing at the hands of Audible in the Holy Bull was a true race on his part, then Audible may be even better than people think and he has absolutely no shot in here. You can’t fault his pedigree, so at least he has that going in his favor. He occupies this final spot over top horses like Flameaway, Lone Sailor, and Solomini because he at least does everything in a classy way and did finish a solid third in the Champagne Stakes last year in only his second career start, then won the Kentucky Jockey Club Stakes at Churchill, a race that has produced six stakes winners this year. He’s tough and honest and we’ll see how far that can take him. The only reason I dropped FLAMEAWAY was because of the projected scenario of the Derby, as it looks as if he is going to get caught up in a very contentious pace with several of the favorites, while having to chase a fast horse in Promises Fulfilled and possibly Mendelssohn. It is going to be difficult for him to establish a lead where he can use his best weapon, which is fighting off challengers, of which there will be many. He demonstrated his sharpness by working a half-mile in :47 4/5, going toe-to-toe with a workmate, and, of course, sticking his head in front at the wire. I feel he will be a presence in the Derby as they come to the head of the stretch, but he is going to have to fight off so many brilliant horses at that point, it is going to make it difficult for him to do so and still be right there at the finish. But one thing is for sure, he will give his usual 100 percent. And he could be in the frame if the absolute perfect pace scenario plays out. From a handicapping standpoint, SOLOMINI’S wide trip in the Arkansas Derby makes him a live longshot to hit the board. I did, however, want to watch his last work to see if he could go through a work without any issues at all, which would at least offer some promise that he could finally put together an effort to show off his talents without any of his quirks. He seemed to be working well, breaking off about a half-length inside his workmate. By the time they reached the quarter pole, he already had his head cocked a bit to the inside, and when the rider tried to get him to switch abruptly to his right lead, his stride became awkward and he threw his head up. He did manage to switch leads, as unsmooth as it was, and, as expected, gamely held off his workmate, but going into the turn after the wire, he started to get out and the rider had to give him several smacks on the neck to get him back in focus. So, although you have to be an admirer of this horse’s tenacity, consistency, and courage under fire, he just needs to mature and grow out of his quirks that can be so frustrating. He definitely belongs in the Derby, and who knows, perhaps with 19 other horses to occupy his attention, he can be a factor. Another of the many talented horses in the field who seems to be getting good at the right time is LONE SAILOR, who started the ball rolling at Churchill Downs by shocking everyone with his blistering :57 3/5 five-furlong work, which is an amazing move for a closer. It was quite a show watching him come from more than 10 lengths back and charge past his two pacesetters in the stretch. The Louisiana Derby runner-up, who likely cost himself the victory at Fair Grounds by drifting out at a crucial moment in the stretch, came back and worked a more conventional :48 half, in what may be the real sneaky Derby work. Going off his opening eighth in a sharp :11 4/5, he slowed it down a bit and then flew home his final eighth in :11 3/5, and kept going strong past the wire with a :12 3/5 eighth to complete his “gallop-out” in 1:00 3/5. Although I could not find room for him in the Top 12 at this late date, with him having won only one of his eight career starts, he is a horse on the improve who definitely should be considered in all exotic bets and is a legitimate longshot threat to pick up the pieces at the end. He just needs to improve several points in his Beyer, Brisnet, and Thoro-Graph numbers to be competitive with this field. One horse who has been threatening to break out with that big career performance all year is the steady COMBATANT, who always fires in the stretch, but just keeps finding ways to get beat. He had his first work over the Churchill Downs track on Monday, breezing a half in :49 3/5, moving very smoothly and efficiently down the stretch. Although he’s won only a maiden race in seven career starts, he has never been worse than fourth and just needs the right pace setup if he is to have any shot. He was compromised by the slow pace in the Arkansas Derby, but like several others in the field, he earned a huge late pace figure on Brisnet and his backers will have to hope the pace in the Derby in fast enough or contentious enough to give him a shot in the stretch. There have been several 30-1 type horse who have closed fast to finish in the money in the Derby in recent years, and if anyone is going to be that surprise horse this year, it could very well be him, even though his pedigree does not exactly shout 1 1/4 miles. But he runs like a horse who should have no problem with it. What in the world has happened to INSTILLED REGARD, who looked like a major player following his second (via disqualification) in the CashCall Futurity and impressive score in the LeComte Stakes at Fair Grounds? But after a pair of uninspiring fourth-place finishes in the Risen Star Stakes and Santa Anita Derby, he has become the forgotten horse. This is a horse with an exceptional pedigree who I had highly ranked earlier in the year. He was the last horse to back into the Derby field after the defection of Quip, and he did look good working five furlongs in 1:00 4/5. But if only we knew what happened in the Santa Anita Derby, when he failed to fire at all, finishing almost 11 lengths behind Justify. His speed figures have remained pretty stagnant and he just hasn’t moved forward since the LeComte. I am curious to see how he trains at Churchill Downs. There really hasn’t been any horses who aren’t working well. These are Derby horses and they are supposed to work well coming into the race of their lives. PROMISES FULFILLED, who has a ton of improving to do off his Florida Derby debacle, worked a sharp five furlongs in 1:00 2/5, in which he jumped back to left lead in deep stretch and was being pushed along in his gallop-out. His only chance is to hope the others pay no attention to him and let him get out there and wing it on the lead, figuring he is easy pickins’ at any time. He was able to get away with it in the Fountain of Youth Stakes, but at some point a cavalry charge of contenders are going to swoop down on him and he better have a big enough lead and the stamina to keep going. Another is FIRENZE FIRE, who was highly thought of when he won the Champagne and Sanford Stakes last year and scored in the Jerome Stakes in his 3-year-old debut. But he has tailed off since, and the big question with him is whether he is as effective around two turns, where he is winless in three starts. He was a well-beaten fourth in the Wood Memorial and has yet to match the 90 Beyer speed figure he earned in the Champagne. 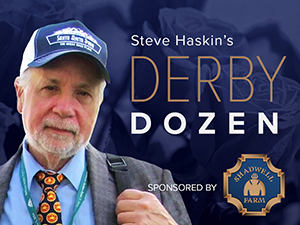 So, that puts a wrap on this year’s Derby Dozen. It’s been quite a ride. I will attempt to piece everything together in my selections, wagers, and analysis column on Thursday.